Last Week in Review: Home sales and economic activity impress. Forecast for the Week: Housing, manufacturing and consumer data won’t take a holiday break. View: Get five ideas to give back throughout the year. “Third time’s the charm.” The BellRayes. 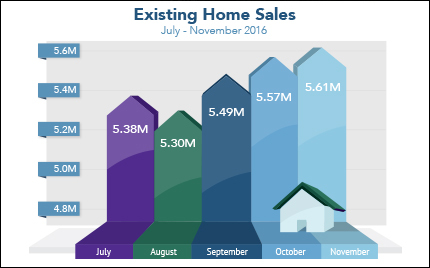 Existing Home Sales hit nine-year highs, and the third reading of third quarter Gross Domestic Product charmed. The National Association of REALTORS® reported that Existing Home Sales in November edged higher by 0.7 percent from October to an annual rate of 5.61 million units. Year-over-year, Existing Home Sales were up 15.4 percent, but that number could be distorted. “Know Before You Owe” or “TRID” rules went into effect November 2015, and many mortgage applications last year were pushed into December with the new requirements. November New Home Sales were also up 5.2 percent from October, coming in above expectations. Economic activity was alive and well in the third quarter of 2016. The final reading for third quarter Gross Domestic Product (GDP) came in at 3.5 percent, above the 3.3 percent expected and well above the anemic readings of 1.4 percent in the second quarter and 0.8 percent in the first quarter. Within the report, consumer spending was up 3.0 percent from 2.8 percent. Business investments surged to 1.4 percent from 0.1 percent. GDP represents the total dollar value of all goods and services produced over a specific time period, and it’s one of the primary indicators used to measure the health of a country’s economy. This report was welcome news. For homebuyers and homeowners looking to refinance, a strengthening economy may seem like a mixed blessing. Why? If our economy continues to strengthen, and Stocks continue to improve at the expense of Mortgage Bonds, home loan interest rates could slide higher. Although home loan rates rose to their highest levels in 2016 at the close of the year, they are still in historically low territory. If you or someone you know has any questions about home loan rates or products, please don’t hesitate to contact me. Trading volumes should decrease in the week between Christmas and New Year’s, but data releases don’t take holiday vacation. The S&P/Case-Shiller Home Price Index will be released on Tuesday, followed by Pending Homes Sales on Wednesday. Consumer Confidence will be delivered on Tuesday. Thursday brings weekly Initial Jobless Claims. Regional manufacturing data from the Chicago PMI will be reported on Friday. As you can see in the chart below, Mortgage Bonds gained a little ground recently. Promote local businesses by purchasing local whenever you can. If you’ve got a website, make note of the ones you trust with links and descriptions. Or mention local businesses with photos or check-ins at the establishments on your social media feeds. And if you have clients who are new to your area, your tips will also help them get acclimated to the neighborhood. Sponsor food drives as an easy way to help people in need. Many organizations are in need of food year-round. Don’t just wait for holidays to roll around. Make a regular collection throughout the year and invite partners, clients and team members to take part. Start a mentoring program for younger people in the community. Check with local youth groups for pre-existing programs or develop one of your own that will help develop skills kids need in the workforce. Promote a local event related to charity work. For example, marathons or family fun runs reinforce community, health and fitness. Offer your skills as a professional by teaching a local adult education class. Many of the skills you use every day — whether you’re a tax or financial planner, real estate professional, or just really good with Microsoft Word — can be transferred to adult education. You also may be able to offer your skills as a volunteer board member with a local charity. This list can help you develop lots of ways you can be unique in your charitable giving. And if these ideas aren’t enough, here are even more ways to give back.